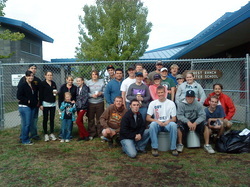 The Love Chico 2011 crew ready to work. FRCS says a great, big thank you to the 2011 Love Chico crew. About 20 energetic, happy young people converged on FRCS about 8:30 AM on Sunday September 25th. The cool weather that morning had everyone moving briskly and all the jobs they came to do were finished in no time at all. The lines on the blacktop were repainted, the garden fence and blackberry vines were removed, the vinca by the MPR was removed to make room for the gardening elective students to plant bulbs, and the picnic table area was cleaned out to make room for some decomposed granite to prevent muddy feet this fall and spring. We are looking forward to next year already!